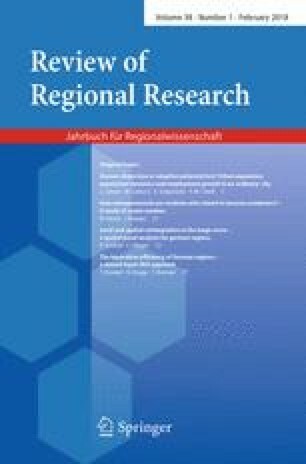 The paper contributes to the debate on how to measure regions’ innovation performance. On the basis of the concept of regional innovation efficiency, we propose a new measure that eases the issue of choosing between industry-specific or global measures. We argue for the use of a robust shared-input DEA-model to compute regions’ innovation efficiency in a global manner, while it can be disaggregated into industry-specific measures. We illustrate the use of the method by investigating the innovation efficiency as well as its change in time of German labor market regions. It is shown that the method treats regions that have industry structures skewed towards industries with high and low innovation intensities more fairly than traditional approaches.